Internal T-Mobile email from Jon Freier sent to us from anonymous source. Yesterday we reported that the Samsung Note7 could be getting the boot from major carriers sales floors. 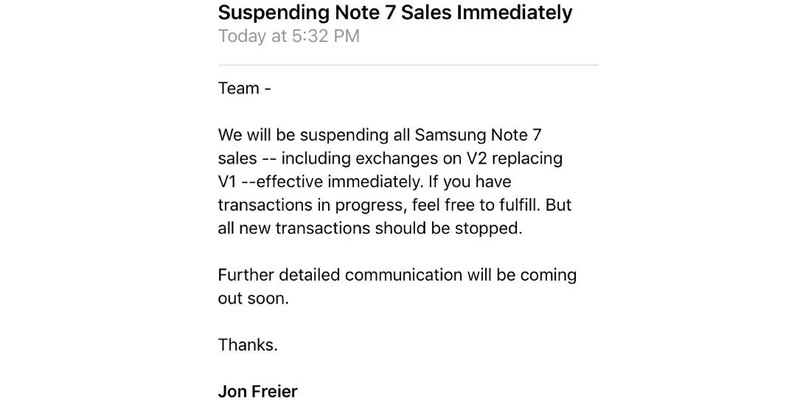 At the time AT&T was the only confirmed carrier that was pulling the Note7 from their stock but just minutes ago we were sent confirmation that T-Mobile is suspending sales immediately. As we mentioned in our article from yesterday, AT&T had already allowed users to exchange their Note7’s (bad ones and replacements) for any other smartphone of their choosing. We further speculated that AT&T’s bolder move of pulling Note7 sales would have a ripple effect and other carriers would follow suit. While reports keep coming in of Note7’s exploding and catching fire, this move by both T-Mobile and AT&T is probably the safest move they could make to minimize damage to their brand. I am further suspecting that Sprint and Verizon will likely follow suit here and pull sales within the week. There have been a few editorials written today on various sites about the whole situation and Samsung’s role and handling of it all. We can only say that while Samsung is dealing with what they have to deal with internally, the carriers pulling sales is probably the best move for everyone. We’re still not 100% positive why these phones are exploding but we hope that Samsung gets the chance to look at the already damaged devices to find out why. In the meantime, we’ll keep an eye out for Verizon and Sprint to do the same and we’ll report back if they end up pulling sales as well. What do you think of T-Mobile suspending sales of the Note7 in their stores? Do you think the other carriers will follow AT&T and T-Mobile lead? Let us know your thoughts and comments below or hit us up on Twitter, Facebook and Google+.